The Crown Commercial Service website has moved. This page will no longer be updated. Please use this link to access our new website. Once there, we hope you’ll take a little time to familiarise yourself with our new home and some of the many improvements we’ve made. The redesign has been based on your feedback - we’ve addressed some of the problems of the past and have been inspired by user suggestions. Our framework contents and pipeline pages have moved to our new home but are now accessible within a much more satisfying user experience. Our new website is your single source for everything you need from Crown Commercial Service. 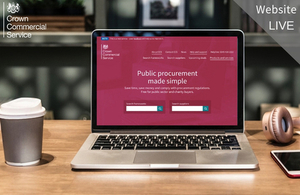 It has been designed around customers and suppliers and will make public sector procurement simple.